Modern three bedroom apartment in Tavira for LONG TERM LET with communal swimming pool large private terrace with 6 seater Jacuzzi. Modern three bedroom Apartment in Tavira with communal swimming pool and large private terrace with 6 seater Jacuzzi. Construction: Covered area 131m2 excluding balconies and private roof terrace. Built in 2007. This luxury apartment is located in Tavira with all amenities within easy walking distance. A car is not needed, but if required there is ample free parking available. Within 3 km / 2 miles you find 3 supermarkets; Pingo Doce, LIDL and ALDI. For entertaining and relaxing it is an ideal place to stay. Tavira is situated on the Ria Formosa which produces sea salt and has a myriad of wild life including flamingos and pretty butterflies. The water ways are busy with yachts, fishing boats and ferries particularly in the summer when visitors hop across the water to the Island of Tavira. The Island has a good choice of restaurants in an otherwise un-spoilt area of outstanding natural beauty. This large three bedroom apartment offers all the comfort of modern life nestled in the old world charm of the historical Tavira with its many restaurants, cultural events and the famous beach at Ilha de Tavira. The apartment is impeccably furnished and there is a delightful and well thought out private roof terrace for entertaining or relaxing with Spa and sun loungers. The apartment is also an ideal place to use as a base to explore the Algarve, it's many beautiful beaches, water sports and the golf courses near by. Benamor golf is the nearest 18 hole golf course approx. 2,5 kilometer down the road. The golf courses of Quinta da Ria and Quinta de Cima are less than a 10 minutes drive away. This spacious apartment consists of an entrance hall leading to the good size living room with dining area and south / east facing balcony, a spacious modern fully fitted and equipped kitchen, three double bedrooms all with built in wardrobes. There are two bathrooms of which one is en-suite to the master bedroom. One bedroom has 2 single beds, the other 2 have double beds (master bedroom with king size bed). the The apartment has air conditioning in all rooms, windows with mosquito netting, electric blinds and sun awnings, various balconies with table and chairs. Guest may use the large Jacuzzi seating 6 on the private roof terrace from where you have far reaching views. There are also 6 sun loungers which can be used by the communal swimming pool. 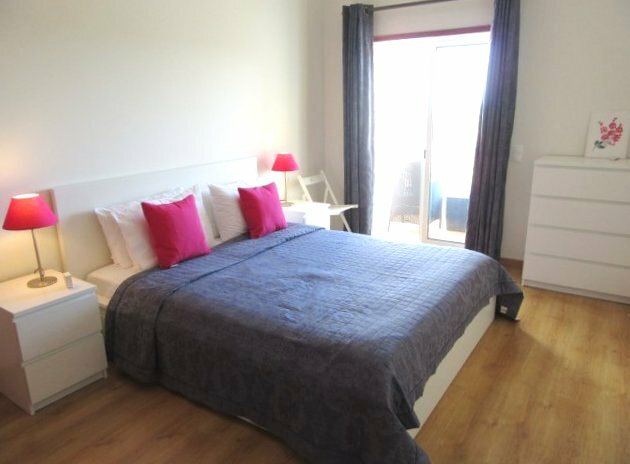 This apartment is an ideal place to relax and enjoy everything the beautiful Algarve has on offer. 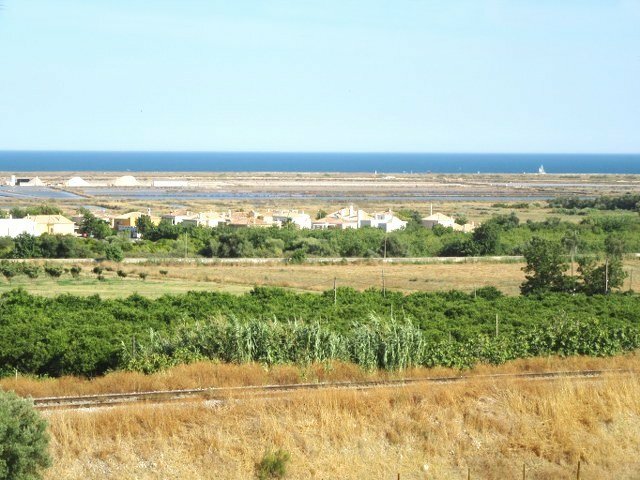 Distances: Faro: 30 km; Boat ferry to beach: 3 km; Beach: 4 km; Nearest restaurant: 300 mtr; Supermarket: 250 mtr; Train station: 1 km; Golf : 4 km; Spain: 30 km. Price is per month, excluding utilities. Minimum stay two months. Bed linen and towels (excluding pool & beach towels) included. Sorry, no smoking and no pets. Car not essential.